If you see a new feature that you might want, that your older Midi Partner doesn't have, then call us about having yours updated. We can usually do this for the cost of the carriage. Midi Partner is easier to use than to read about - so if you don't like reading instructions just plug in and try one out - you will be playing in minutes ! 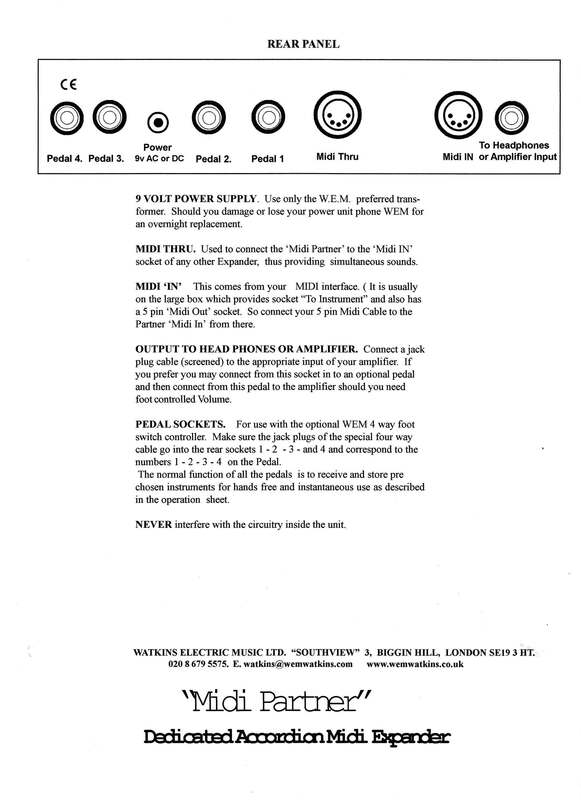 Below are shown the basic operations sheets for the MIDI Partner. Click the links or just scroll down. Remember that the Midi-Partner may be small but it delivers sounds that rival (and surpass - according to some of our customers) the most expensive large expanders. This may be a clich?, but it really is made by accordionists for accordionists ! - if you are new to MIDI, see the MIDI and the Accordion page. See Testimonials for another quick overview. The first is the Front panel controls operations sheet. This shows the front panel and the controls and functions that you are presented with as standard. Normally all except the basic MIDI messages are filtered out to avoid confusion and to aid easy operation, however you can turn MIDI control and program change etc on if you wish - see detailed instructions. The second is the Special editing features sheet. If you want to be a little more adventurous and want to try and change some of the sounds or functions on the Midi Partner, then this sheet gives a summary. e.g. Did you know that you can change any of the preset sounds for 1of 128 sounds stored inside along with a preset amount of reverb ? The third is the Rear panel connections sheet. This is the back panel showing the connections to the Midi Partner. It's very straight forward - Electrical power in, Accordion in and Sounds out to your amplifier.......and optional 4 way footswitch for hands-free operation........and did you know that the Midi Partner remembers your footswitch settings and that the footswitches are assignable to (can be made to function as) any of the font panel buttons? If you want to see detailed descriptions of the Expander and its facilities see the detailed instructions and specs. * New features added for 2005. - If you play in an accordion orchestra, you may play the bass section of the Midi Partner with your right-hand as well as or instead of the left hand by starting up the Midi Partner in the 'Orchestral Bass mode', this setting is remembered until you reverse it. The right-hand sound buttons are not functional in this mode but all other features are available. * New facility from Oct. 2006 - Master tuning control added. By holding down the Right-Hand 2 (Rh2) Mute button, the Mute LED flashing shows that the Master tunning mode is operating and using the Rh2 Reverb control you can tune/detune to any instrument over about a quarter tone range. This setting is remembered and the Midi Partner will power-up with the new tuning. Press the Mute button again to resume normal playing. 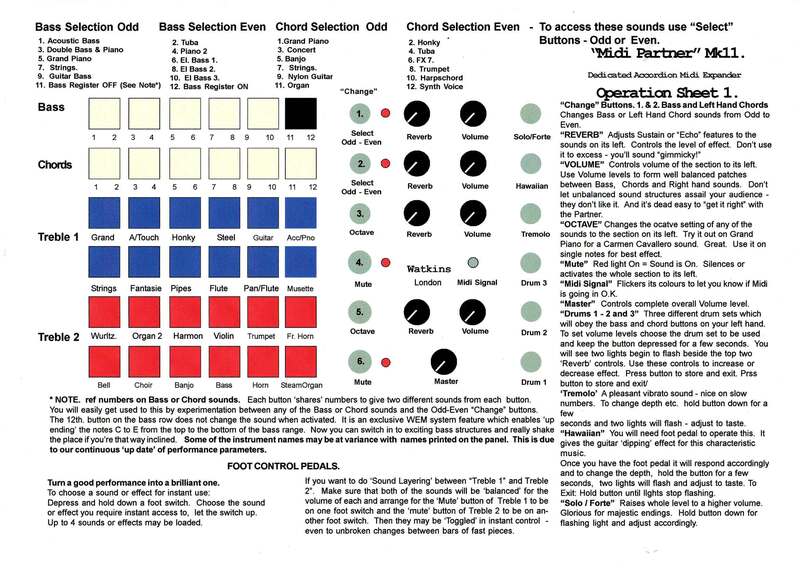 The Basic Midi Partner Operations Sheet. - showing the basic control functions. 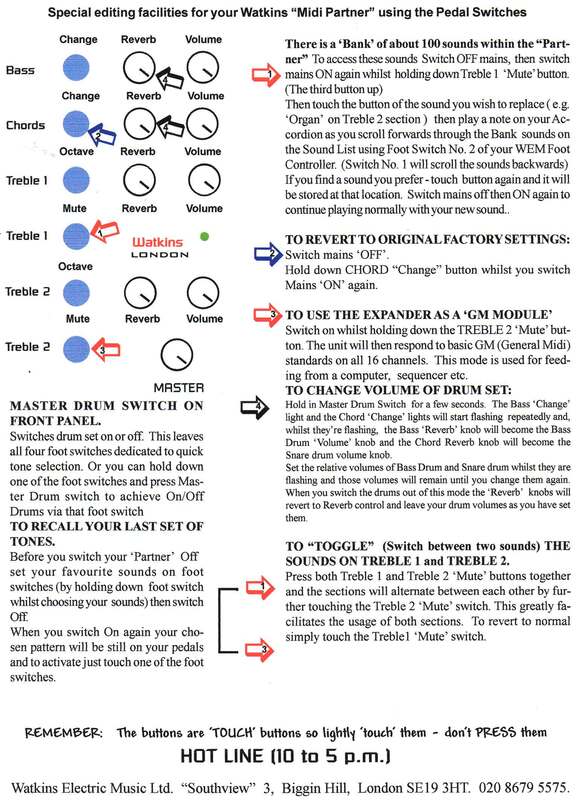 The extra functions sheet below will now have to include the new Orchestral Bass mode setting (from Jan 2005 - older units can be upgraded - call us). Hold right-hand 1 and right-hand 6 and then switch on. The bass section can now be played from the right-hand keyboard. Repeat to disengage. 38 note polyphonic, 4 Channel (1,2,3 & 4) multitimbral MIDI sound generator module. 128 internal sounds - 41 available on front panel. 4 assignable footswitches to any front panel button. One Mono audio output - Line or headphones. MIDI In and MIDI Thru connectors. Uses any 9 Volt power adapter (300mA or more). GM mode available. For more info see the detailed instructions and specs page.